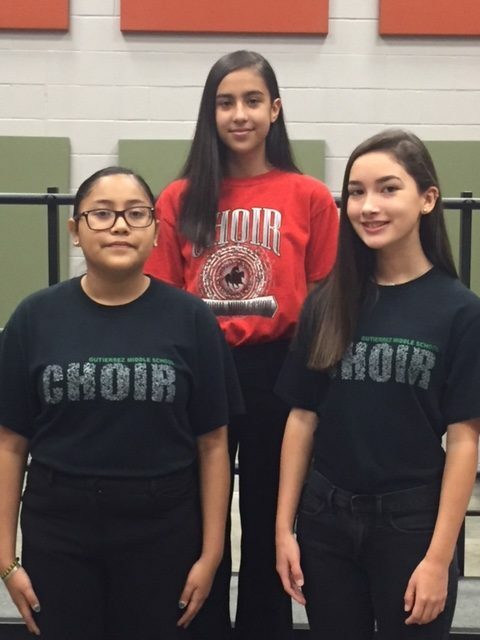 This past summer three Harlingen CISD choir students were selected to participate in the Texas Choral Directors Association 2018 Honor Choir. Receiving the honors were Kelly Gonzalez and Elise Hernandez from Gutierrez Middle School as well as Emily Garza from Memorial Middle School. The elite honor choir was comprised of approximately 150 students who completed fourth, fifth and sixth grade in 2018. Hundreds of students from around the state auditioned for a chance to be part of this prestigious group. These young singers were featured in the 2018 TCDA Convention held in San Antonio on July 26-28, 2018. The students worked with guest conductor Ruth Dwyer over two and a half musical and fun-filled days and brought the event to a close with a concert performance for over 1,000 choral directors.